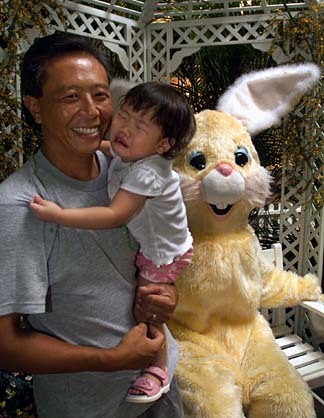 Wally Chun, above, held his 20-month-old daughter, Devyn, who refused to take a picture with the Easter Bunny yesterday at Kahala Mall. They left without a picture. 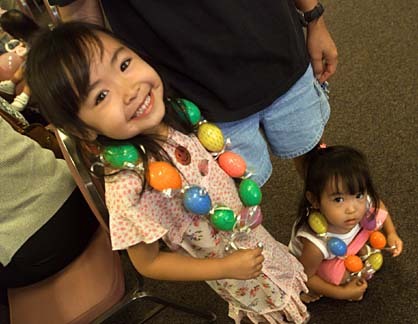 5-year-old Jaci Ishikawa and her 2-year-old sister, Jayni, wore Easter-egg leis at Ward Warehouse. Jaci had her painting displayed as one of the kindergarten district winners in the Nuuanu-Kalihi District's 2004 Children's Art Exhibition. 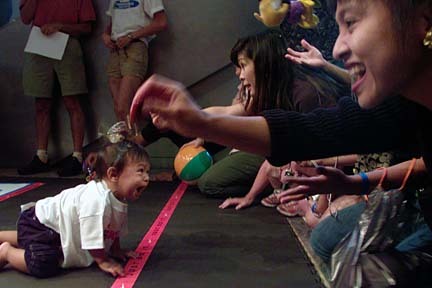 Tears did not stop 10-month-old Zephyr Kitakis from winning the second heat of the Huggies Diaper Derby yesterday held at Nike Town in Waikiki. The Derby was one of several special events leading up to the 2004 USA Triathlon to be held in Honolulu April 18th. Zephyr won a year's worth of Huggies Diapers.